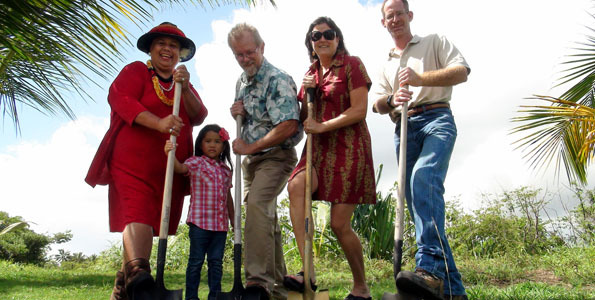 A blessing and groundbreaking took place today at Isaac K. Hale Beach Park, where construction will begin on a new community playground in Puna. Fifth District Councilwoman Emily K. Naeole offered the blessing at the site. Joining in the ceremonial shovel-turning to launch the project were Aubrey Summers, park designer for the Department of Parks and Recreation, Dan Weisgerber, project manager for Goodfellows Bros., Inc., Hunter Bishop, representing Mayor Billy Kenoi, and Councilwoman Naeole. The new playground will open a new area of the park, Summers said, and include a deck tower with a roof, four slides, climbing elements and swings. It will have van accessible parking stalls at the existing parking area, an accessible walkway to the play area, barriers between the parking area and the play area, and landscaping that will complement the nearby camping area. Goodfellows Bros., Inc. won the construction bid for the $199,000 project. Honma said the Department’s maintenance crew will be installing swing sets, using County employees to reduce the overall cost of the project. Mayor Billy Kenoi said the groundbreaking confirms the county’s commitment to build more parks and recreational facilities in the communities of Puna Makai. “By assigning County crews to part of this project, the parks department is saving money for the County and getting better equipment for the community,” Kenoi said. The playground is expected to be complete by Feb. 25, 2011.